Interestingly, yesterday, I heard from five different companies about using BPM for marketing. 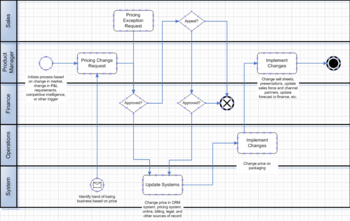 So, I have spent the day (and will continue to spend time) flushing out the marketing processes and the value proposition associated with improving marketing processes and managing them using BPM. Pricing struck me as a good one since yesterday my wife was looking at a golf club (Taylor Made R7 driver). At the store we buy from, it was $300. Online and in the paper at the store down the street, it was $190. Our golf pro called the Taylor Made rep and found out that the other store had jumped the gun. The discount wasn’t supposed to begin until this weekend. Now, both the store and Taylor Made are going to sacrifice several days of higher prices all because the pricing coordination didn’t happen right. Coordination of releasing information across channels and partners is a big deal but something that a basic rules engine could manage.